Yin and yang, shabby and chic, sea salt and dark chocolate (mmm…chocolate…). Opposing forces that come together to make something awesome. That’s NIGHT and DAY! Join us, PJ Makinen (PM) and Alanna Makinen (AM) on our relatable journey of finding fitness and nutrition while raising two active boys, working full-time jobs, and making time for friends and memories. We’ll talk CrossFit (shocker), diet and meal planning, parenting, and other daily life topics from two different points of view. Have a listen, have a laugh, and come along on our journey to balancing the good life and good health. After a great vacation away PJ and Alanna get back in the swing in episode 22. We give a recap of our ski vacation to Quebec, read a couple of great reviews, go through some What The Hell Is Wrong With People and PJ finally gets a good Rapid Fire theme picked. WE ARE BACK BABY!! After a long break due to our crazy busy life we were able to sit down and record episode 21! We chat about hockey (surprise, surprise), new music we like, firings from CrossFit HQ, and finish with a lack lustre Rapid Fire (according to Alanna). Shout outs to: Monkey Sword Fight Podcast, Lift Heavy Run Long Podcast, Nail Studio by Stephanie, Greta Van Fleet, Brand New View Podcast. Happy New Year Listeners! In episode 19, PJ and Alanna kick 2019 off with a bang and talk about our holidays, Alanna's upcoming CrossFit competition, gruesome sports injuries and as always we have a spirited WTHIWWP and Night and Day Rapid Fire! Check it out. 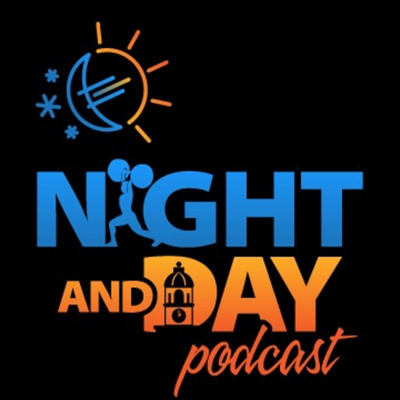 Please consider leaving us a review to let us know how we are doing and send us your topic/theme suggestions to nightanddaypodcast@gmail.com. Find us on FB and IG as @nightanddaypodcast and on Twitter as @nightdaypodcast. Episode 16 has PJ realizing that Alanna "may" be funnier than he is. We have some good chat about poor customer service experiences, the Kareem Hunt controversy, two Christmas themed "What the hell is wrong with people, and finish with a holiday themed Rapid Fire. Margaux Alvarez Interview "Train Hard. Recover. Drink Wine"